Last week I took my neighbor Patty to a quilt show, her first. She does a lot of different hand work but not much sewing. 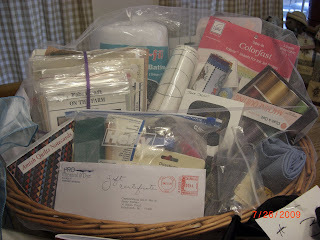 They had these 4-5 baskets stuffed with giveaways from companies raffling $1 ea. for a yard of tickets for $5. They even had people there to fill them out for you. Anyway, who should win one but Patty. This is her on the right and the lady from the guild who happens to work at a doctors office in Boonsboro brought it down for her. So on Monday Morning she said she would have it and we went down. WOW what a basket. 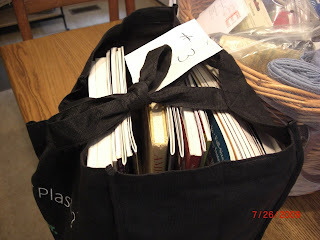 AND that big blue bag full of books. Here again I uploaded two of the same picture. so you have to excuse me. Maybe you will see something different in the second one. this is it. two different sizes of Thangles., some patterns, a couple books and a box of variegated threads by Coats and Clark and a couple spools of white Mottler thread and a spools of brown variegated Essential thread. The gals on the Juki group talk about it.The best thing though which you might be able to see if you enlarge the picture is a roll of 8 fat quarters in the prettiest bright color wheel colors and hands dyed from India. Several other rather large pieces of plain colors, blues and greens. Be good for setting children's blocks together. All in all it was a fun afternoon and great fun. Maybe have converted a quilter. Guess I better mention that Hubby is home and in bed now asleep. Don't know for how long as he doesn't sleep that well. My Daughter came up this afternoon and boy did she get a tan on her Cruise last week She will be here for a couple days. At least while I go to town to get my hair done and a little shopping. Then Thurs.. A..M while I go to my Physical Therapy. Then on Friday our son is suppose to arrive for a week. So a nice busy week. But back to cooking. Also have the Double Delight all sewn together. Just need to trim and add the border. Thanks for stopping. . I am so glad to hear that hubby made it home. I wish him and your family the best. Take care! Glad to hear U. Geo is home. I hope you sleep well tonight. 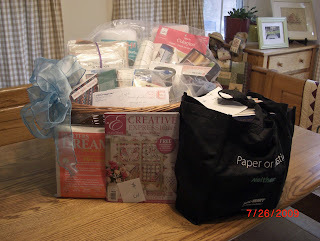 What a grand prize for your friend- It is a lovely way to start quilting- And what a grand bag of books too. How nice for you and hubby to be together again. I hope your daughter had a fabulous trip to the Bahamas. Will she go back to her old school? 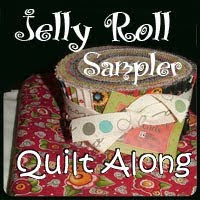 Good for you to continue to get lots of quilting done. I look forward to seeing your finished Double Delight. Time for me to press the Star blocks. They are ready to sew together. Have a good week with your family. Your girls sure know how to have fun! Cooking, again. I hope that you have a wonderful time with you DH home, as well as during your daughter and son visits. Wow! That is quite a basket!! 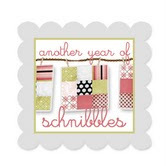 I can't wait to see your double delight quilt! Hope DH will continue to do well. guess Patty is a quilter now... she's already got a start on her stash! Glad to hear that hubby is home and I hope he is on the mend soon. So glad to hear that the basket is home safely too..... I'll have to email Jeane the link to your blog. Such fun you and Patty had and I left comments on her blog too so seeing your pics and hers, wow, what a win!!! Very very fun!!! I hope you have a good week with your family and that your hubby is improving!!!! Sounds like you and your friend had a wonderful day, and such a lot of neat things to look through. I hope your DH does well and that you enjoy visiting with your children. I'm sure that they will be a help getting your husband settled in and hopefully giving you a break at times. Wow that is a lot of stuff. It looks like a lot of fun. Your double delight is coming along quite nicely. 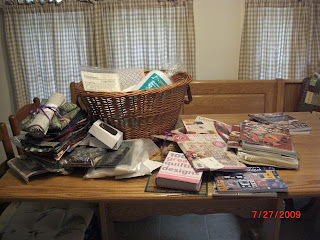 One of these days, I am going to make that quilt. Thank's for this page, very useful info.